Redbud trees are native to the United States and can be found from Florida to Pennsylvania and as far west as eastern Texas. The tree is among the first to flower and is often a bellwether of spring. 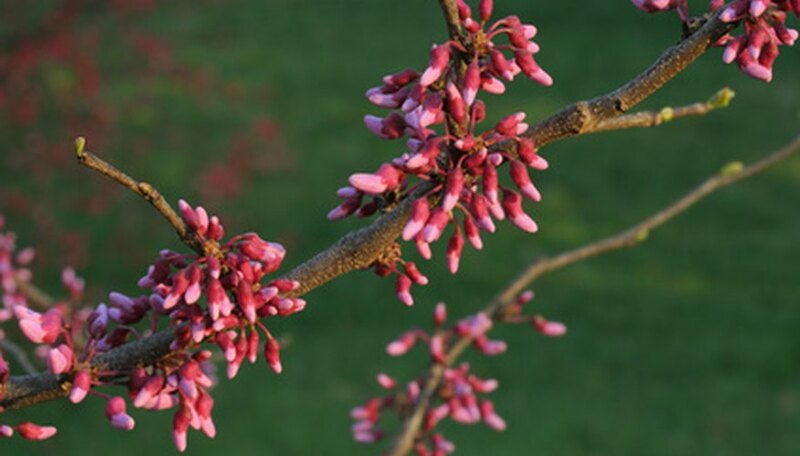 Redbud trees get their name from the bright red flower buds that form along the branches prior to leaves appearing, providing a colorful display. The trees are relatively free of disease, however, the U.S. Forest Service Silvics Manual does point to three diseases that significantly affect redbud trees. Botryosphaeria ribis is a fungus and the cause of a canker that is the most serious illness that can affect redbuds trees. The canker forms on the branches of the tree. They are sometimes visible on the surface of the bark as dark, sunken areas with black centers. The disease is spread by splashing water or wind that transports spores to healthy parts of the tree. The fungus spreads through the vascular system of the tree and slowly blocks the flow of fluids within the plant. This causes a gradual dying of branches as the flow of water and nutrients is interrupted. To treat the disease, prune out all dead branches at least 4 inches below the point of infection and destroy them. Be sure to disinfect pruning tools after each cut to reduce the risk of spreading infection. Fungicides can be used to control the fungus prior to infection, but there is no chemical control for the canker once it has become established. Verticillium wilt is caused by the soil-borne fungus Verticillium dahliae and sometimes kills redbud trees, particularly in the Midwestern United States. The disease normally enters the tree through the root system, but can also enter through a wound. It infects the vascular system, preventing water and nutrients from reaching the upper portions of the plant above the infection. The leaves wilt from lack of water and turn yellow, eventually dying and falling from the tree. Treat verticillium wilt by pruning away and destroying dead branches at least 4 inches below the dead areas. Disinfect pruning tools after each cut to help prevent spreading the infection. Water redbud trees that are suffering from verticillium wilt two to three times per week to a depth of 2 to 3 feet to ensure the plant is receiving adequate water. Leaf anthracnose, also known as leaf spot, occurs primarily in wet weather. It is caused by the fungus Mycosphaerella cercidicola. The disease presents as rusty brown or black spots with a raised border, later developing a gray appearance on the upper surface. While this disease can be unsightly, it is generally not serious. Chemical controls are usually not necessary, but liquid copper may be used in serious cases and as a preventative measure. Raking and disposing of fallen leaves to reduce the risk of spread is also helpful.